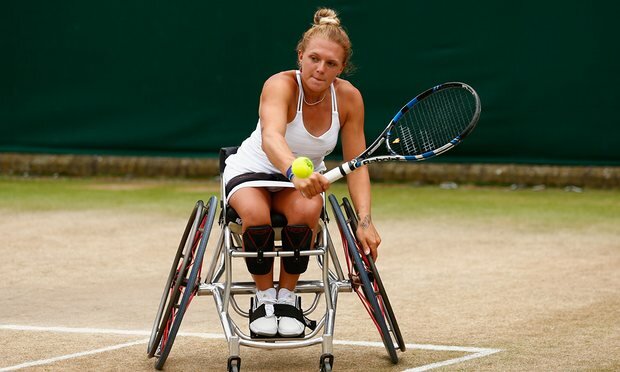 Wimbledon’s first wheelchair singles tournaments will get under way on today (Thursday 7th July), following on from the success of the sport at London’s 2012 Paralympics. Wheelchair doubles matches have been played on the grass courts of SW19 since 2001, and now singles contests have been introduced after success in the majors in Australia, France and the US. Gordon Reid, 24, from Glasgow, the world No 3 in the men’s game, who won the Australian Open singles at the start of the year, said: “I’m just really excited to get going. I grew up watching Wimbledon on TV, mainly the singles event. It was always a dream of mine to play singles here.” He plays Frenchman Nicolas Peifer in the quarter-finals. Five British players from the Tennis Foundation’s wheelchair tennis world class programme are among the 16 contesting the championships. In the women’s draw Louise Hunt, 25, faces Marjolein Buis from the Netherlands, and in the men’s draw Alfie Hewett, 18, from Norfolk, faces Dutchman Joachim Gerard. Wheelchair tennis rules are the same except that the ball is allowed to bounce twice.